Realtor Web Sites – Tour Real Estate Inc. 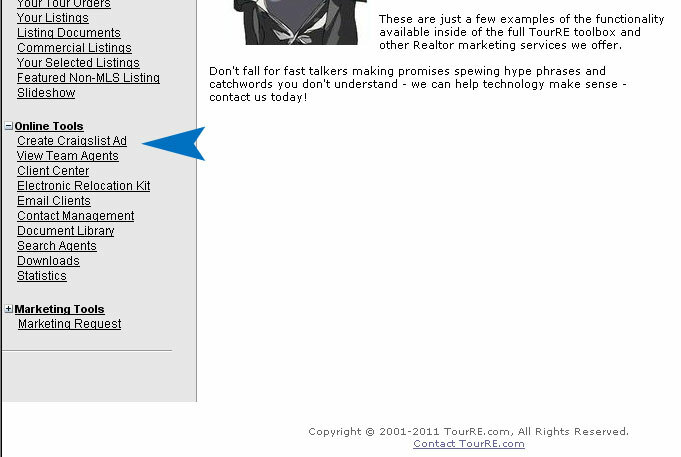 REALTORS: Does Your Website Need Help? Our Websites Come in One Flavor: AWESOME! We don’t fast talk or up-sell you with pricey packages you don’t need. We don’t lock you in to long costly contracts. We JUST deliver results. For over the last decade Tour Real Estate has consistently provided the very best real estate websites and marketing tools available online. ALL of our websites are highly search engine friendly; come backed by powerful dynamic code which allows you to control your search engine visibility. For less than the cost of a single print ad, or a few months of unreliable pay per click advertising you could have your own website online 24 hours a day 365 days a year showcasing your listings and services. We founded our company on virtual tours; we still offer some of the best and most affordable real estate photography services in the area. Better Photos = Better Sales. It’s as simple as that. A REALTOR.COM survey showed that homes marketed with professional quality photographs sold for nearly 12% more than homes with bad or no images. Social media is the fastest growing method for increasing your digital footprint and gaining exposure for your listings and services. More people begin their search for homes, and for qualified REALTORS® online than ever before. To reach this crucial market you need to be highly visible amidst the ever growing tide of real estate professionals online. In a previous post (brokers) we discussed how TourRE’s powerful website system can help you get all of your agents main web portals connected to your brokerage for optimal online visibility. But even if by some horrible possibility you or your agents don’t have our real estate websites there is still much you and they can do to benefit from social media. Ask them to LIKE and/or follow your company pages and profiles. Ask them to LIKE, share, or comment on the things your company posts. Ask them to share a link to the company website as a status update. Ask them to invite their friends to follow your company pages/profiles. If they have Google accounts make sure they visit your company site and give it a +1. Encourage your agents to post their listings and links on the company social profiles. Get your agents to write articles for the company blog. Offering your agents special incentives for helping to bolster the brokerages social presence isn’t unheard of either, although in all honesty by them participating in the offices online success they are truly already the recipients of a reward all it’s own. Social media interaction from individuals is one of the biggest ways to really see results online; these social signals are gaining importance in how search engines rank your websites – what’s more, through social media you are increasing real human interaction independent of the search engines help. Every agent online makes a difference and with just a little interaction on their parts you can potentially see immense returns. Have questions about using social media for real estate? TourRE can help! We’re always glad to talk shop and we offer some of the most affordable social media management services online today! Tour Real Estate Inc, your provider of the best REALTOR® websites online today has just released a NEW homepage module for our modular templated websites! The new Real Estate News module pulls top real estate based news stories direct from the pages of Yahoo! News and displays them on your homepage. This module is automatic and updates from the news source with new content as it is released! This is a great way to share real estate news with your visitors without having to crawl the news sites looking for information. It’s easy to add – first, login to your Client Toolbox. Click Customize Homepage Content in the menu at the left. When that page opens you will see the two boxes containing your modules, just above that click Add/Remove Default Homepage Module. Pick Real Estate News from the list and click Save Changes. The new module will now appear on your front page – revisit the Customize Homepage Content section to move the module and place it wherever you like on your page. These little homepage modules are just some of the sort of great functions and features we are constantly developing for our real estate website customers. If you have an idea for a module you’d like to see don’t hesitate to contact us – we’re always glad to hear ideas regarding how we might better improve our services. Stay Tuned to this blog and our other social networks for the latest news and developments from your real estate technology solutions provider, TourRE! More Tour Real Estate REALTOR® websites appear in the top search engine results than any other one company. We’ve been innovating online real estate for over a decade, and we’re only getting better. Tour Real Estate has helped establish the industry standard in real estate technology for over the last decade. We understand social network media for real estate and how you can leverage it to gain better exposure for your listings and services. Unlike many new real estate technology companies that talk a good game and blow a lot of smoke, we believe in providing our clients with the tools they need, not selling them a lot of hype that they can’t use. Maybe the Gold Package isn’t for you. Already a TourRE customer? We can work with you to help you make the most of the tools found within our system at little to no cost; are glad to help you learn the keys to better exposure for your digital presence. Contact us today for your REALTOR search engine optimization consultation so we can custom tailor an online strategy for your success in the coming new year! Creating graphical Craigslist ads from your TourRE Client Toolbox is easy! You pick the look, the listing, and the message – we supply you with the code to create attractive graphical Craigslist ads. You must first be sure to have a account on Craigslist. If you do not have one create one before starting the ad making process in the toolbox. On the page that opens you can begin creating your ad. First choose the look of the ad you want to create. 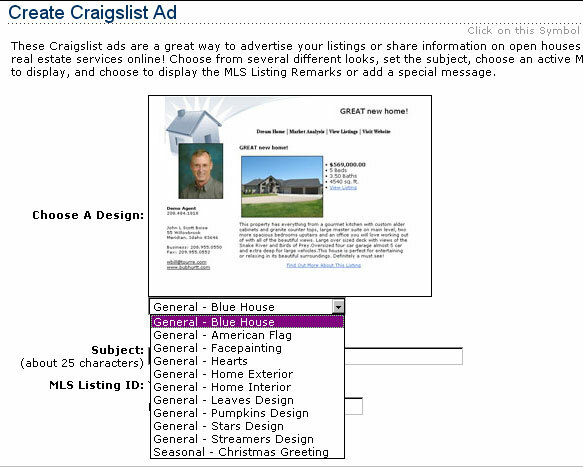 Next pick one of your listings from the drop down list or enter ANY active MLS listing in the space provided. This listing information will appear in your ad along with the main photo from the listing. 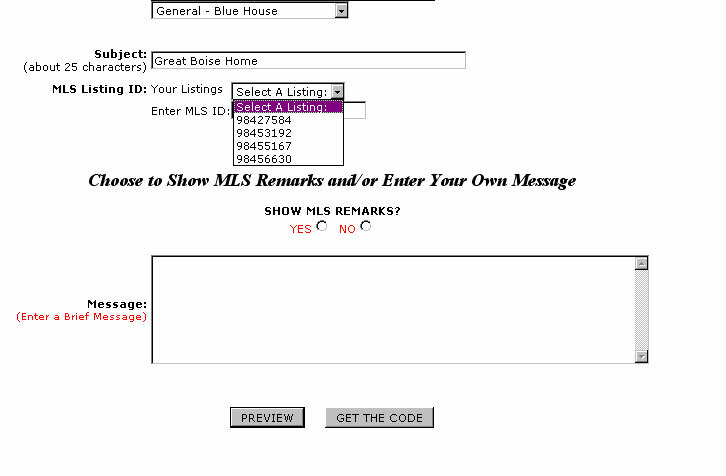 From here you can choose to include the remarks from MLS and/or enter your own personal message. Once these steps are complete you can choose PREVIEW to see how the ad will appear or choose GET THE CODE to open a window where you can copy and paste the code to create your ad. Once you have copied the code simply login to your Craigslist account, choose to POST and then the correct category (usually Real Estate for Sale). Enter the Price, Posting Title, and Location in Craigslist. Paste the code from your Toolbox into the space for Posting Description. You can add additional photos if you like, or the address. When all information is entered click CONTINUE to preview and finalize your ad. This is just one more of the great features Tour Real Estate offers in their Client Toolbox for today’s progressive REALTOR. TourRE offers the most powerful REALTOR websites online today – through our dynamic functionality we offer REALTORS the tools they need to control their online presence and move more real estate! !